Bicycling would be easy if there were plenty of bike racks, bike friendly transportation, and locks that really protect your bike. Are you longing to take your bike anywhere you want to go? We've got a better idea. 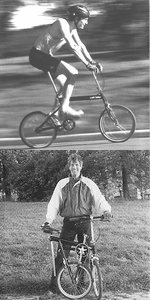 What about a bike that's fun to ride, durable, and can fold up in ten seconds flat? A sporty riding, spitfire of a bike that handles as well on the road as in your duffel bag. It's so compact that you can easily slip onto a crowded train. Packed neatly, it can fit into a suitcase and follow you to the ends of the earth. The swift folder is versatile enough to fit everybody. And talk about sturdy. The integral hinge provides a way to fold the bike with ease, while maintaining the integrity of a rigid frame. 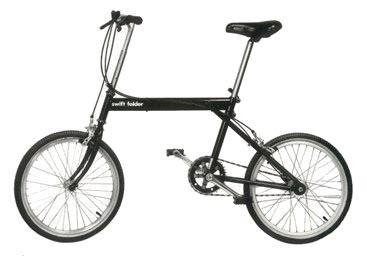 Twenty inch wheels and internal seven speed hub design means that this bike takes off fast. It really kicks. There are no delicate parts to tinker with when folding, making it an easy traveling companion. 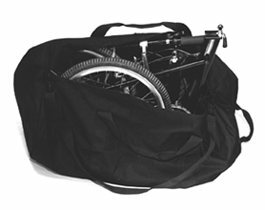 The quick fold (see photos below) reduces the bike to a size that fits right beside your desk, in a trunk, or in the closet. Take a few more minutes and the swift folder can fit inside a standard piece of luggage. It couldn't be easier. The quick fold is fast. Step 1, flip the releases and lift the seat. Step 2, lift the bike up to fold. Step 3, push the seat post all the way down. This secures the bike in the folded position. It's a snap.